G. E. Bentley, Jr., now retired from the University of Toronto, is working on a biography of Blake. Robert N. Essick, Professor of English, University of California, Riverside, has been writing sales reviews for this journal for 25 years. BIBLIOGRAPHER: G. E. Bentley, Jr.
MANUSCRIPTS are welcome. Send two copies, typed and documented according to forms suggested in The MLA Style Manual, to either of the editors: Morris Eaves, Dept. of English, University of Rochester, Rochester, NY 14627; Morton D. Paley, Dept. of English, University of California, Berkeley, CA 94720.
INTERNATIONAL STANDARD SERIAL NUMBER: 0160-628x. 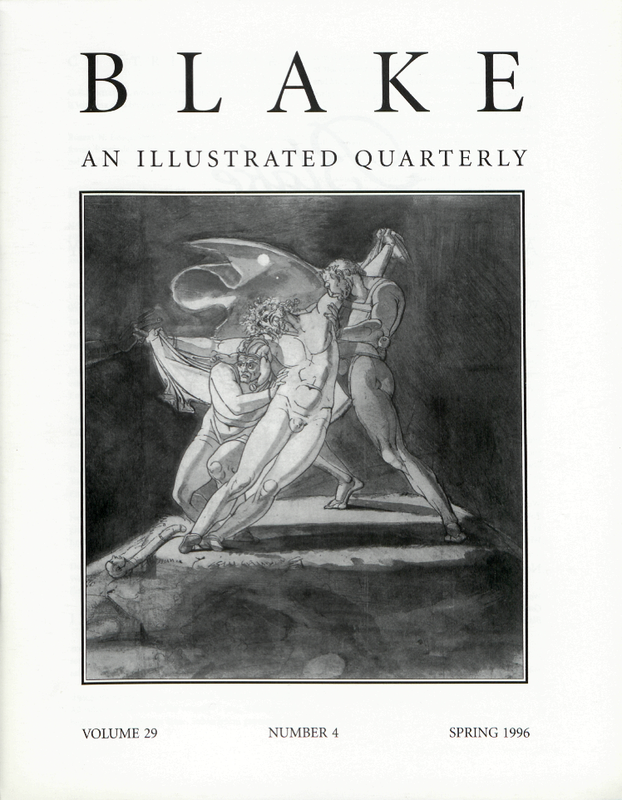 Blake/An Illustrated Quarterly is indexed in the Modern Language Association’s International Bibliography, the Modern Humanities Research Association’s Annual Bibliography of English Language and Literature, The Romantic Movement: A Selective and Critical Bibliography (ed. David V. Erdman et al. ), American Humanities Index, Arts and Humanities Citation Index, Current Contents and the Bibliography of the History of Art. Cover Illustrations: Henry Fuseli, detail of Edgar, Feigning Madness, Approaches King Lear, photo courtesy of Sotheby’s London.